Developed for an affluent residential community, Wrightsville Beach maintains a year-round population of just under 3,000 residents. But, since this idyllic beach town has been hailed as “where the rich go on weekends” by The Wall Street Journal (1999) and as one of the “best places to vacation” by Money Magazine (2001), the population swells considerably in the summer months with thousands of overnight visitors and day trippers. Yet, Wrightsville Beach is not a typical beach resort town. Unlike the crowded oceanfront stretches of the Outer Banks and the gaudy touristic attractions of Myrtle Beach (think mini golf, waterslides and chain restaurants), Wrightsville Beach scores high marks for its B’s: beaches, boats, boards, and beauty. Wrightsville Beach has maintained its residential charm and clean beaches despite the brisk commercial growth surrounding the island. Because Wrightsville Beach is a small island (just five miles long), nestled between the Atlantic Ocean and the Intracoastal Waterway, one is never far from the water. Naturally, ocean-based activities abound in these clear, warm Gulf Stream waters. The Intracoastal Waterway traces the shore here, creating a protected highway for watercrafts. Boaters love the many accommodating marinas that surround Wrighstville Beach. Facilities are available for every marine-related need: boat and yacht sales, brokers and charters, sailing schools, boat launching ramps, repairs, fishing gear and more. There’s Atlantic Marine and Seapath Yacht Club on Motts Channel; Bradley Creek Marina on the western shore of the ICW (which caters exclusively to the local community); The Bridge Tender Marina, the Dockside Marina, and Wrightsville Beach Marina, all located near the Wrightsville Beach drawbridge and each with its own popular restaurant. For kayaking enthusiasts, there is a new 5-mile trail that winds through the island’s marshes. If sailing is your pleasure, you’ll enjoy the many regattas both in the sound and on the ocean. Jet skiing, windsurfing, and parasailing are also fun water-based recreation activities. 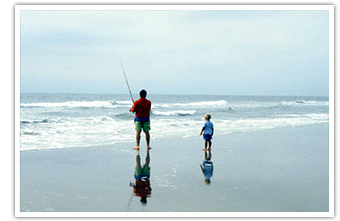 Fishing can be done from the piers (Johnnie Mercer’s pier is the public day rate fishing pier) or in the surf (free). Of course, charter boats are also available for everything from fly fishing in the sounds to marlin fishing in the Gulf Stream. There are numerous annual fishing tournaments (like the Wrightsville Beach King Mackerel Tournament) for sport and for charity. Wrightsville Beach has some of the best surf on the east coast. Surfers can take lessons from a number of surfing camps and instructors. A great local resource for surfers is the website, wblivesurf.com, featuring a live surf cam, daily surf reports and wave forecasting tools. You can also pick up some tips from the pros during summertime surf championships. Additionally, there are four public, lighted, hard-surface tennis courts and several sand volleyball courts at the Wrightsville Beach public park. The park also has children’s playgrounds, softball fields, soccer fields, and basketball courts. Golfers won’t be disappointed by the golf courses that are just a short drive from Wrightsville Beach. Of course, the beach itself is a huge draw for area residents. You might work up an appetite walking in the unspoiled white sand, watching native marsh birds or loggerhead sea turtles, or following dolphins playing in the surf. If you prefer cooking at home, head to Mott’s Seafood or the Wrightsville Beach Farmers’ Market for provisions. The Monday morning market (May-September) includes a small group of vendors offering fresh and local produce, flowers, herbs, baked goods, eggs, meats, doggie treats and flowers. On Friday evenings in May through October, relax in beautiful Airlie Gardens while enjoying the jazz music concert series. Whether you tap your feet or tap into a bottle of great wine, it’s sure to be a perfect outdoor evening. Summer brings the annual Castles and Scoops sand sculpting contest. Wrightsville Beach celebrates the advent of the holiday season with the NC Holiday Flotilla celebration. Year-round, Wrightsville Beach and the surrounding areas offer unique shopping and entertainment opportunities. In 1899 Wrightsville Beach was incorporated as a resort community. The Tidewater Power Company once owned the island, and developed it to attract visitors and revenue. The Wrightsville Beach Museum of History, housed in beach cottage circa 1910, exists to preserve and to share the history of Wrightsville Beach. NNames of past relics like the grand hotel built in 1905 and the Lumina recreational center still grace local businesses (The Oceanic, Lumina Station) and even the island’s weekly newspaper, Lumina News, which is published every Thursday. Today, Wrightsville Beach is busy and prosperous, boasting a median average yearly income that far surpasses both the state and county averages. The fiscal year revenue for the town of Wrightsville Beach was $19,506,849, more than $8 million per square mile! Tourism is the economic powerhouse of Wrightsville Beach,, with hotels, restaurants and retail services reaping the benefits of the town’s population surge each summer. Neighboring Figure Eight Island is an ultra-exclusive oceanfront resort community where Al Gore's family and many a Hollywood celebrity have spent their vacations in recent years. 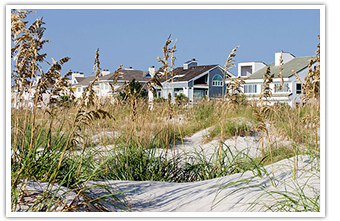 And nearby Landfall is a private, gated community that has also fortified the economy of Wrightsville Beach and spurred commercial development like Mayfaire Towne Center,, home to revered retailers such as Fresh Market, Williams Sonoma, Pottery Barn and upscale independent establishments. Local lawmakers are vigilant about ensuring that Wrightsville Beach keeps its charm, instituting laws and codes that protect both its citizens and the natural beauty of the area. Retirees are drawn to the small-town beach community of Wrightsville Beach and the surrounding conveniences of the city of Wilmington, just five miles away. The well-preserved atmosphere of Southern charm, family values, and exclusivity, enhance the rich natural splendor of the island. 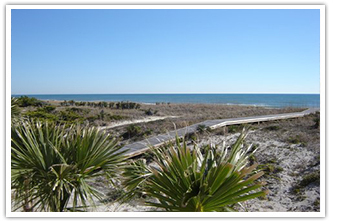 Indeed, the natural beauty and serenity of Wrightsville Beach make it a crown jewel on the Carolina coastline. The temperate climate, laid-back pace, and gorgeous sunrises are also a big selling point for those seeking an idyllic location in which to enjoy their golden years. During summer months, temperatures usually fluctuate between the 80s and 90s, with July being the hottest month. During the short winter, temperatures average in the 40s but sometimes dip into the 30s. The rest of the year means pleasant, mild temperatures in the 60 to 70-degree range. While Wrightsville Beach hasn’t sustained significant damage from a hurricane since 1999, you should be aware that it can potentially lie in a storm’s path. For retirees who still have four-legged children at home, pets on leashes are permitted on Wrightsville Beach during the off season (October 1-March 31). In short, Wrightsville Beach is a treasured oceanfront community where one can enjoy retirement (and beach living) at its finest: inviting waters, soothing sands, picturesque surroundings, a strong community, and all of the amenities that Wilmington and New Hanover County have to offer. In 2001, Wrightsville Beach received the MetroBravo! Award for a great place to own a second home. Of course, area residents have known that for ages. Many homes on Wrightsville Beach stay in families for generations, creating an exclusive atmosphere and a stable real estate market that makes home ownership on this beach one of the best (and most expensive) real estate investments in North Carolina. Although residential areas are densely populated, development has been controlled by the high cost of land and the vigilance of local residents and lawmakers. Building ordinances limit the size of new houses based on square footage relative to lot size, keeping the development palatable. Consequently, properties for sale on the island used to be few and far between. In our current economic climate, more properties are available, but Wrightsville Beach homes for sale continue to hold their value. Over the last 20 years, as land values escalated, many older beach cottages were renovated or replaced by larger, modern homes, making the community an attractive option not only for year-round residents, but also for investors and buyers of second homes and summer houses. Whether it’s an oceanfront property with a backdoor of clean white sand or home with a sweeping vista of the Intracoastal Waterway, it is not surprising that real estate in this unique beach community is highly coveted. 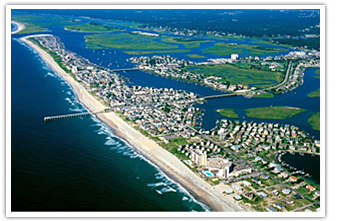 Wrightsville Beach is anchored in North Carolina’s history as a wonderful place to visit, to live on, and to invest in. If you would like to own a piece of Wrightsville Beach that will become a favorite family destination for generations, please Contact Us today. 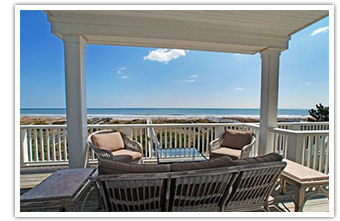 Ready to Search for Wrightsville Beach Homes for Sale?